To Cite: Soleimani A, Rafatpanah H, Nikpoor A R, Kargari M, Hamidi Alamdari D. Tumor Necrosis Factor-Related Apoptosis-Inducing Ligand Gene Polymorphisms and Hepatitis B Virus Infection, Jundishapur J Microbiol. 2015 ; 8(11):e23578. doi: 10.5812/jjm.23578. Background: Tumor necrosis factor-related apoptosis-inducing ligand (TRAIL) is an apoptotic molecule with a key role in the apoptosis of tumors and virus-infected cells. The association of 1525G/A and 1595C/T polymorphisms in the region of 3’ UTR on the TRAIL gene has been shown in many cancers and diseases. Polymorphism at the positions of 1525G/A and 1595C/T might influence the clearance of hepatitis B virus (HBV). Objectives: This study was carried out to determine the role of the TRAIL gene polymorphisms in clinical outcome of HBV infection. Patients and Methods: Polymerase chain reaction-based restriction fragment length polymorphism (PCR–RFLP) was applied to genotype TRAIL polymorphisms at positions 1525G/A and 1595C/T. To evaluate the TRAIL gene polymorphism in the 3’ UTR region at position 1525G/A and 1595C/T, 147 patients with HBV infection were divided into three different groups of chronic hepatitis (n = 52), cirrhosis (n = 33), and carrier (n = 62) and there was a group of 101 healthy controls. Results: Our data showed that genotypes 1525G/A and 1595C/T were in complete linkage disequilibrium and the genotype frequencies at the two positions were the same. No significant differences in frequencies of genotype and alleles at positions 1525G/A and 1595C/T were observed between all the three groups (P value > 0.05). Conclusions: According to our result, 1525G/A and 1595C/T were in strong linkage disequilibrium and the polymorphisms of the TRAIL gene in the 3’ UTR region were not associated with the outcome of HBV infection. Hepatitis B is an infectious disease caused by hepatitis B virus (HBV) which affects the liver (1). The genome structure of the virus is double-stranded circular DNA and is related to Hepadnaviridae family (2). Infection with HBV is a serious health problem throughout the world and the outbreak of the disease is nearly 300 - 350 million people around the world. So far, two billion people have been infected with this virus (3). Studies have shown that 35% of the Iranian population has been exposed to HBV and about 3% of them are chronic carriers (4, 5). In advanced stages, the disease can cause cirrhosis and hepatocellular carcinoma (5, 6). Tumor necrosis factor (TNF)-related apoptosis inducing ligand (TRAIL) or Apo2L is a type II transmembrane glycoprotein with a molecular weight of 32.5 kDa, containing 281 amino acids and is related to the super family of TNF-α which was discovered in 1995 by Wiley (7). The TRAIL gene is located on chromosome 3q26 and contains five exons, which encodes an approximately 1.77 kb mRNA (8, 9). The TRAIL molecule is known as an apoptotic factor which is expressed in most tissues of the body; studies have shown that TRAIL induces apoptosis in cancer cells, while healthy cells keep from this apoptosis activity (10). Apoptosis is mediated by conventional receptors known as death receptors4 (DR4) and DR5 or TRAILR1 and TRAILR2. Other TRAIL receptors such as TRAILR3, TRAILR4, and OPGR that act as decoy receptors do not induce apoptosis (11). The TRAIL gene expression is increased in models of HBV viral infections, suggesting that the TRAIL-TRAILR system is able to eliminate virus-infected cells (12-14). It should be noted that the expression of the TRAIL levels in viral infections is associated with HBV infection (15). Host genetic factors affect the disease progression and response to therapy in HBV and since the clearance or the stability of an antiviral is largely dependent on the host immune response, the study of factors affecting the immune system is important. Genetic association studies have demonstrated the role of genetic factors in outcome of HBV infection (16, 17). Many candidate gene polymorphisms such as human leukocyte antigen, TNF-α, interferon gamma (IFN-γ), cytotoxic T lymphocyte-associated protein 4, and chemokine receptor 5 (CCR5) are reported to be associated with susceptibility to chronic hepatitis B, while the role of the TRAIL gene polymorphism is unclear in the outcome of HBV and other viral infections (18). The TRAIL gene has four single nucleotide polymorphisms (SNP) at the regulation region of 5’, two SNPs in exons, and five polymorphisms in the 3’UTR (9). Polymorphism in the 3’UTR region, unlike other TRAIL polymorphisms, is more common in different populations. The polymorphisms of TRAIL at positions 1525G/A and 1595C/T among the five polymorphisms in the 3’UTR region are functional and are associated with certain diseases such as breast, prostate and gastric cancers, multiple sclerosis (MS) and fatty liver diseases (19-23). To our knowledge, the association between the TRAIL gene polymorphisms and HBV infection has not been studied yet; thus, in the present study, we examined the association of TRAIL gene polymorphism and outcome of HBV infection. A total of 147 patients with chronic HBV infection including 62 carriers, 52 chronic HBV infected and 33 liver cirrhosis patients who had been referred from different parts of Khorasan Razavi province to Gastroenterology Research Center, Imam Reza Hospital, Mashhad University of Medical Sciences (MUMS), Mashhad, Iran, were enrolled in this study. Chronic HBV infection was defined based on positivity for HBsAg for at least six months and elevation in serum transaminases level. Liver cirrhosis was characterized based on liver histological examination and clinical and paraclinical characteristics. Inactive carriers included patients with no evidence of viral activity in clinic, laboratory, or pathology. Patient with evidence of co-infection with hepatitis C virus (HCV), hepatitis D virus (HDV), human immunodeficiency virus (HIV), and human T-lymphotropic virus (HTLV)-I were excluded. A total of 101 samples of blood control including males and females with a mean age of 35.9 ± 10 years were used as healthy controls; the differences in the gender ratio and age between the patients and the controls were not significant (P > 0.05). The study protocol was approved by the Ethics Committees of MUMS and written informed consent was taken from all the patients. Four milliliters of blood containing EDTA was drawn from all the patients as well as from the healthy controls. The genomic DNA was extracted by Genet Bio kit and then genomic DNA was preserved at -20°C. PCR-restriction fragment gene polymorphism (RFLP) technique was applied to investigate the genetic polymorphism at positions 1525G/A and 1595C/T on the TRAIL gene. Primers were used based on previous studies to amplify the 484-bp TRAIL gene with the following sequences: forward, 5’-AACATCTTCTGTCTTTATAATC-3’; reverse, 5’-AAATAACACGTACTTACTGAAG-3’ (9, 22). 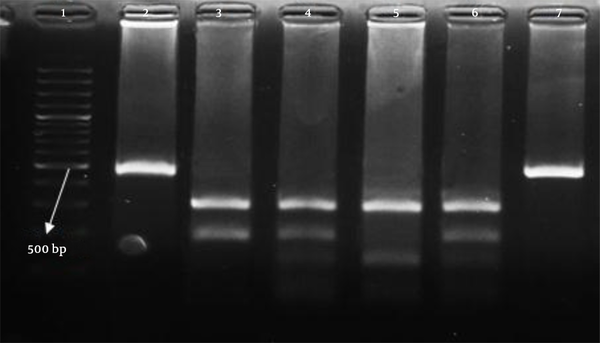 The PCR reaction mixture was prepared in 25 μL containing 150 ng DNA template, 2.5 μL 10x PCR buffer, 0.5 μL dNTPs, 10 pM forward and reverse primers (mixture) and 1.2U Taq DNA polymerase (Parstous, Iran). The TRAIL gene was amplified in a thermal cycler from Bio-Rad Company with three phases, including the following: 1) five minutes at 95°C for denaturation of the double-stranded DNA; 2) 30 cycles with three steps, 45 seconds at 94°C for denaturation of the DNA, 30 seconds at 55°C for annealing, and 45seconds at 72°C for extension; 3) five minutes at 72°C. All the PCR products were checked on 2% stained agarose gel with ethidium bromide. The PCR products for the detection of 1525G/A and 1595C/T polymorphism were incubated at 37°C for eight hours with RsaI (from New England Biolab (NEB) and TasI (from NEB) restriction enzymes, respectively. 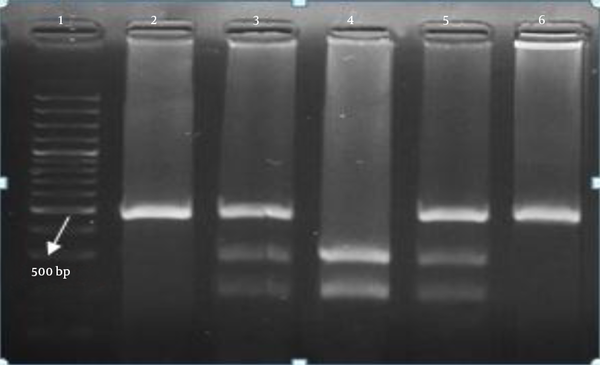 Finally, the digested samples were identified by electrophoresis on 2.5% stained agarose gel with ethidium bromide and were visualized by UV transilluminator. All the data were presented as Mean ± SD. Our study was a case-control study, in which chi-squared, Fisher’s exact, logistic regression and independent t-test tests were used to analyze demographic data, genotypes and alleles between patients and control groups. Hardy-Weinberg equilibrium was checked for the two groups of patients and healthy controls. P value < 0.05 was considered statistically significant. Statistical analysis was performed with SPSS11 software. In the present study, genotype and allele frequencies of 147 patients in the three groups of carrier, chronic, and cirrhosis as well as the 101 healthy controls were carried out with PCR-RFLP method at the two position 1525G/A and 1595C/T in the 3’ UTR region on the TRAIL gene. Demographic and clinical information are listed in Table 1.
aAbbreviations: Alb, Albumin; AFP, Αlpha-fetoprotein; ALP, Alkaline phosphatase; ALT, Alanine transaminase; AST, Aspartate aminotransferase; Bili D, Bilirubin direct; Bili T, Bilirubin total; INL, International normalize ratio; Plat, Platelet; PT, Prothrombin time; PTT, Partial thromboplastin time. The PCR products were digested by RsaI (from NEB) and TasI (from NEB) restriction enzymes. The digested fragment sizes are shown in Table 2 and also the pattern of electrophoresis for both positions of 1525G/A and 1595C/T are shown in Figures 1 and 2, respectively. Lane 1, DNA marker (100 bp); lane 2, PCR product; lanes 3 and 5, AG genotype; lane 4, AA genotype; lane 6, GG genotype. Lane 1, DNA marker (100 bp); lanes 2 and 7, PCR products (484 bp); lane 3, CC genotype; lanes 4 and 6, CT genotype; lane 5, TT genotype. The Genotype and allele frequencies of SNPs in the patients and healthy controls were inconsistent with Hardy-Weinberg equilibrium (patients: χ2 = 0.148, P = 0.70; control group: χ2 = 2.304, P = 0.128). Our data showed that the frequencies of genotypes GG/CC, AG/CG, AA/TT and alleles G/C, A/T were completely similar to each other at both positions of 1525G/A and 1595G/A, which exhibited that the two variants of TRAIL at sites 1525 and 1595 seemed to be in perfect linkage disequilibrium in the Iranian population. The frequencies of genotypes and alleles between the patients (carrier, chronic and cirrhosis) and the controls are shown in Table 3. As presented in Table 3, there was no statistically significant association between genotypes and alleles of patients and healthy controls at the sites of 1525 and 1595 of the TRAIL gene and the outcome of HBV infection. We also could not find any association between polymorphisms at the two sites with age, gender, and other clinical characteristics. The outcome of HBV is different; a group of subjects eliminated the virus without causing any clinical symptoms or they could rehabilitate from the illness after an acute inflammation (24). However, chronic infection will develop in 5 - 10% of the infected subjects. Often, patients remain asymptomatic and have no symptom of infection; however, 10 - 30% of patients develop cirrhosis and hepatocellular carcinoma; so approximately, 80% of this malignancy is associated with chronic HBV or HCV infections (3, 25). Many factors such as virological, immunological, and host genetic factors contribute to the outcome of hepatitis B; subjects with insufficient primary immune response against HBV infection are more capable to chronic HBV. Indeed, the immune system has a major role in determining the clinical signs or symptoms of hepatitis B (26). The immune system has a key role in the outcome of the disease by inducing apoptosis by TRAIL and other apoptotic factors such as FAS Ligand (14). The TRAIL molecule is expressed in both forms of soluble and membrane-bounded. This protein has been identified in many different human tissues and immune system cells like T cells, macrophages, dendritic cells, and natural killer (NK) cells and under inflammatory circumstances, it induces apoptosis in viral infections and transformed normal cells or cancer cells (20, 27). According to previous studies, the level of sTRAIL increases after HBV infection (15). If the expression of the TRAIL molecule is increased due to the effect of IFN-γ, the infected cells get sensitized to the TRAIL molecule via HBx protein (expressed by HBV genome), which eventually leads to the apoptosis of infected cells (28). 3’ UTR as the regulator region in the protein expression level is not just mRNA, but binding mRNA covered with RNA proteins (RBPs) and micro-RNAs (miRNAs), playing important roles in translational regulation. Therefore, allelic variation by changing the expression level of the protein in the genome of patients, especially in the 3’UTR region, has played an important role in the outcome of disease (17, 29). It has been shown that AA/TT genotype at sites 1525G/A and 1295C/T in the 3’UTR region of the TRAIL gene had a lower risk for fatty liver disease (22). Another study showed that CC genotype increased the risk of MS in the Japanese society (19). Furthermore, CC genotype at position 1595C/T was associated with type 2 diabetes mellitus (T2DM) (23). Several studies have shown the relationship of 3’UTR polymorphism with some cancers such as breast, gastric, and colorectal (21). Polymorphisms in IL-18 gene promoter that alter the level of cytokine production are associated with the outcome of different infections such as hepatitis B, hepatitis C, and AIDS (30). The possible role of the SNPs of cytokine genes in the progression of chronic hepatitis B were investigated in a number of recent studies; but, for the first time, we investigated the polymorphisms of the TRAIL gene at positions 1525G/A and 1595C/T in the 3’UTR. Our results showed that the variation of genotypes between 1525G/A and 1595C/T were in strong linkage disequilibrium, which is similar to the Chinese population (22). Our results showed that the frequencies of genotypes and alleles at both positions of 1525G/A and 1595C/T were not associate with HBV infection. We can conclude that the polymorphisms of the TRAIL gene at sites 1525 and 1595 were not related to the HBV infection outcome. One of the limitations of the study was the selection of cases from different parts of Khorasan Razavi province and because this province is quite a large province, the heterogeneity of the population regarding race is fairly possible and our sample size as a case-control study was relatively small; so, further study with a larger sample size is essential to clarify the association of the TRAIL gene polymorphism with outcome of HBV infection. The authors would like to thank Dr. Asad Mohammadi and Mr. Farhad Molla Hosseini for their cooperation. Authors’ Contribution: All the authors participated in the research design and contributed to different sections of the research. The project was performed as a MSc thesis by the first author; DNA extraction, PCR techniques, and writing of the manuscript were performed by Anvar Soleimani. Sample collection was performed by Mehrdad Kargari. Statistical analyses were performed by Amin Reza Nikpoor. Management of the project and revision of the manuscript were performed by Houshang Rafatpanah and Daryoush Hamidi Alamdari. Funding/Support: This manuscript was extracted from a MSc thesis by the first author with grant number 920674 from Mashhad University of Medical Sciences, Mashhad, Iran.